Pluto New Horizons mission: The dwarf planet explains the history of our solar system. It’s time to stop throwing pity parties for Pluto. The beloved not-quite-planet is about to become the star of our solar system. I’ll go out on a limb and predict that in July 2015, the up-close photos of Pluto we’ll get from a NASA spacecraft will be the most popular astronomical images of a generation. 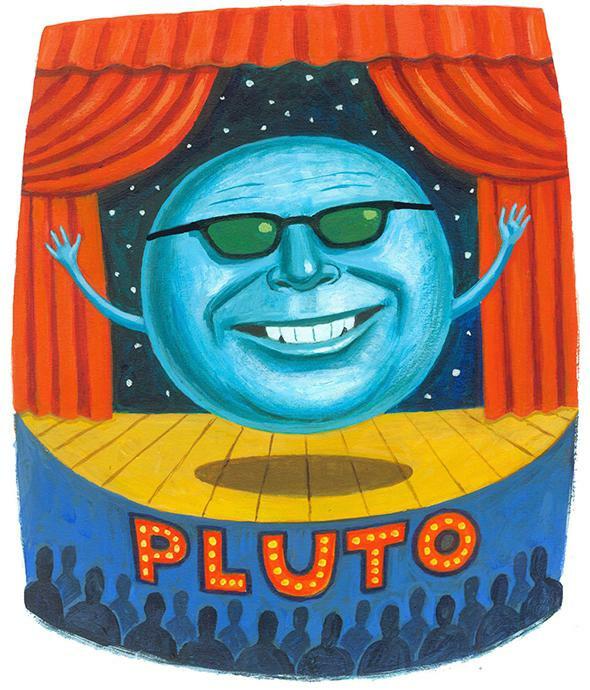 Screensavers, posters, live TV, Twitpics, you name it—Pluto will be everywhere. After all, we’ve been wondering what it looks like for decades. But even now—and this is what most people don’t realize about Pluto—we owe that little iceball a ton of respect. It led the way to a brand-new view of what our solar system is really made of. Here’s the answer in advance: Almost all of the worlds circling our sun are like Pluto. There are thousands of them. Pluto’s orbit, which used to seem weird, also showed us the violent history of how the big planets—the ones that get all the glory—got to where they are now. Its idiosyncrasies gave us the first, and best, clues about the history of our little nook of the Milky Way. All this angst over something that, to be charitable, is a smudge of light. No missions have flown past Pluto, so we’re limited by what we see in telescopes. The object, with a surface area the size of Russia, is so far away—currently about 3 billion miles, more than 30 times the distance between Earth and the sun—that even the best telescopes show Pluto as an indistinct disk with light and dark patches. It has a gossamer atmosphere, frosts made of nitrogen and methane and carbon monoxide, and a whopping moon called Charon (pronounced by some astronomers with a soft “Sh” and others with a hard “K” sound). 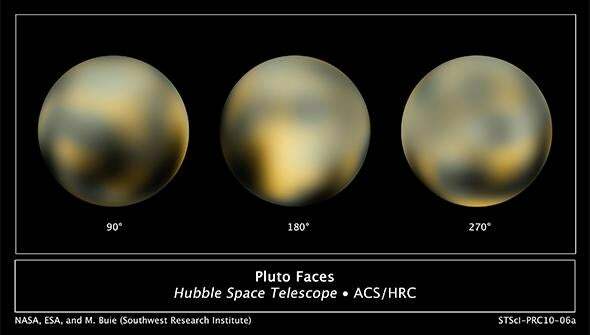 The Hubble Space Telescope has spotted other flecks of light circling Pluto: four more moons. Most everyone thinks Pluto has a bunch of other companions. Artist’s concept of the New Horizons spacecraft as it approaches Pluto and its largest moon, Charon, in July 2015. 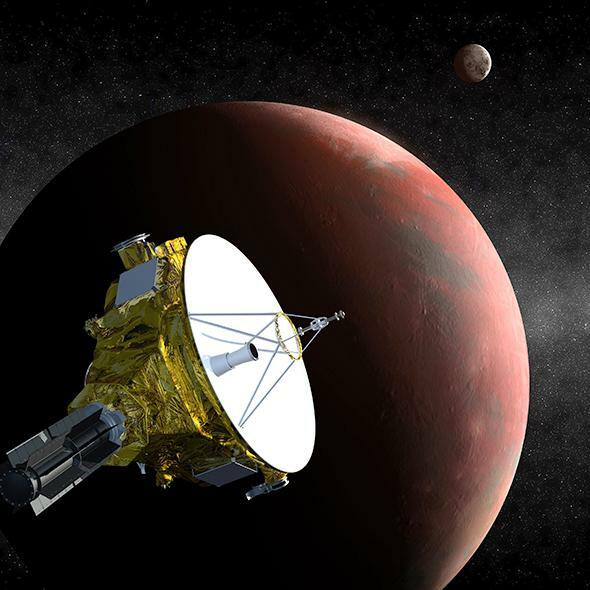 On July 14, 2015, the New Horizons spacecraft will whip past Pluto at more than 30,000 miles per hour after a flight lasting almost a decade. It carries what mission director Alan Stern calls “the best first-reconnaissance set of instruments for a planet, ever.” We’ve had some amazing first looks at the four giant planets over the decades: majestic Jupiter and its bizarre moons, Saturn’s ethereal rings, and the ocean-hued Uranus and Neptune. If you’re old enough to remember the transformations of those bodies from blobs to fully realized worlds by the Voyager missions, you know the potential impact of Pluto’s debut. “Pluto was the harbinger of knowledge that the solar system has thousands of planets, and nearly all of them are tiny,” Stern says. Pluto and those other icy worlds inhabit a vast realm of the solar system called the Kuiper Belt. New Horizons will pay the first visit to such a world. The biggest question is about Pluto’s surface: Is it alive or dead? Pluto’s craters, ridges, valleys, and other landforms may have been frozen and locked in place for eons. The sculpted ices of nitrogen, methane, and carbon monoxide would look eerie and beautiful, but it’s less interesting scientifically if Pluto is stuck that way. There’s a chance—despite surface temperatures of about minus-400 degrees Fahrenheit—that some internal source of heat could make Pluto’s surface ooze, flow, and perhaps erupt with icy geysers. The largest moon of Neptune, called Triton, ebbs and shifts in such ways, creating fabulously exotic terrains. Scientists think Triton is one of Pluto’s cousins, captured by Neptune from the Kuiper Belt billions of years ago. Comparing the two worlds, so unlike anything else we’ve seen up close, will consume scientists for years. Pluto’s tenuous atmosphere is another focus for New Horizons. From Earth, it’s a nearly imperceptible wisp around Pluto’s margins. The light-and-dark patterns seen by Hubble are the barest hint that the atmosphere and the surface interact as the planet’s climate changes. Pluto’s oval orbit takes it so far away (up to about 50 times the distance from Earth to the sun) that the atmosphere may freeze out as bright crystals onto a surface tinged red by methane. The spacecraft also may see clouds and fog: Plutonian meteorology, driven by the planet’s all-natural global warming and cooling. This is the most detailed view to date of the entire surface of Pluto, as constructed from multiple NASA Hubble Space Telescope photographs taken from 2002 to 2003. The barely-there atmosphere has kept us from knowing exactly how big Pluto is. Marc Buie, Stern’s colleague at SwRI, wrote his Ph.D. thesis on Pluto as a last-minute swap 30 years ago, and the planet’s elusive size has fascinated him since. “We’re finally going to know the diameter of Pluto!” he told me in an urgent voice that only an obsessed scientist could conjure. For the record, Buie’s published estimate is 2,306 kilometers (1,433 miles) in diameter. (In contrast, Earth’s moon is 3,475 kilometers wide.) But Buie confided: “I think it’s closer to 2,320 kilometers.” Stay tuned! Pluto’s retinue of moons entices the team as well. Charon, first spotted in 1978, is so bulky compared with its parent—about one-tenth the mass of Pluto—that scientists regard the Pluto-Charon system as a double planet. The other moons orbit this pair: icy shards called Styx, Nix, Kerberos, and Hydra. Here’s the nifty part: Those four moons take almost precisely three, four, five, and six times longer to orbit Pluto, respectively, than Charon does. It’s cold clockwork on a satellite scale. To the SwRI team, this waltz points to a long-ago cataclysm. Some other object from the Kuiper Belt—Stern thinks it was about 600 miles wide—slammed into Pluto to spawn Charon and the other whirling bits. Gravitational kicks and ongoing collisions with smaller debris then shifted the orbits, over time, into the synchrony we see today. If true, that scenario suggests Pluto has more moons; Stern wouldn’t be surprised if he saw at least 10. Crash remnants could be spinning in New Horizons’ path, so an onboard telescope will peer ahead next spring and summer. If the approaching spacecraft has to avoid plowing into smaller fragments, it would be a rather more graceful version of the famous asteroid-dodging sequence in Star Wars—fitting for a mission led by a jet jockey. Then there’s Pluto’s orbit, which gave Pluto its oddball reputation ever since Clyde Tombaugh identified it as a planet in 1930. Pluto’s languid 248-year-long path tilts way out of the flattened plane in which the other planets orbit the sun. It also swoops near and far, lasso-style. (For 20 years in every orbit, Pluto is closer to the sun than Neptune is.) To SwRI theorist Hal Levison, that orbit is a thing of beauty. It’s his portal to an outer solar system full of objects on similar orbits. Those motions, he says, preserve traces of a wilder past. The major clue came from a curious bond between Pluto and Neptune. As Neptune orbits the sun three times, Pluto orbits exactly twice—in such a way that the bodies never approach one another. This stable connection, called a “resonance,” doesn’t arise by chance. The planets must nudge one another via gravity and migrate into those orbital paths until the lengths of their orbits form a neat ratio. Then gravity keeps them there. This happened to Pluto’s moons, too—and astronomers see the same thing around other stars, where some exoplanets orbit in syncopated lockstep. In our solar system, Neptune took the lead. It’s so much bigger than Pluto that it dictated how and when Pluto moved. In the 1980s other scientists proposed that Neptune formed closer to the sun and gradually moved outward, pushing Pluto into the off-kilter loop we now see. The reaction to this idea was tepid until the 1990s, when telescopes started spotting other objects in the Kuiper Belt. “Pluto is not the lone weird thing,” Levison says. Indeed, there are “plutinos,” which share the same 2–to–3 orbital bond with Neptune, and “twotinos,” which orbit the sun once for each two of Neptune’s years. They all got swept into those paths by Neptune’s outward march. This new vision, an outer solar system sculpted by the gravity of Neptune, has taken hold. “Neptune controls everything now,” Levison says. But he and his colleagues didn’t stop there. They used Pluto and the rest of the Kuiper Belt to map out a grander, much more startling picture of our entire solar system’s youth. All four giant planets, they claim, crowded closer together in their orbits in the early age of our solar system about 4.5 billion years ago. They gravitationally tugged on one another, along with swarms of smaller bodies, for hundreds of millions of years. Then, in a spasm set off by an unstable connection between Jupiter and Saturn, the planets migrated violently. Neptune and Uranus might have swapped places. Jupiter’s gravity might have even cast a fifth giant planet out of the solar system. As Neptune raced outward and the other planets shifted, they flung asteroids and comets into an icy, rocky blizzard. Levison came up with the provocative idea, and many astronomers think it’s plausible. Clues are everywhere, he says. Chief among them are the orbits of Pluto’s brethren in the Kuiper Belt. They career every which way, but their paths—when mapped mathematically—trace back to an epoch of wandering planets. Mercury and our moon hold other clues: big craters whose ages and patterns suggest a massive storm of comets and asteroids set off by the moving planets, in a pulse lasting 100 million years or so. If Pluto and Charon are frozen relics, their surfaces may preserve records of this intense bombardment, too. Charting their roles in the chaotic history of the outer solar system is one more mystery New Horizons may solve. Stern and his team hope to steer New Horizons toward another, much smaller object in the Kuiper Belt after they bid farewell to Pluto. But for now, the Pluto system has Stern’s full attention. It’s probably the only time we’ll go there in the next half-century, and he’s not going to muck it up. He knows how excited we all will be.